Chest tightness: Why does it occur while running? Chest tightness is considered as a distressing issue since it might be a warning sign of a heart attack. 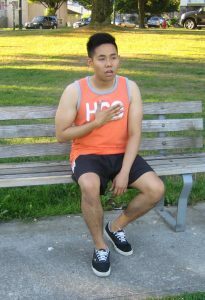 Luckily, there are other conditions that are not life-threatening that can cause tightness in the chest while running. These conditions can originate from the esophagus, lungs, heart or muscles. An individual with exercise-induced asthma usually ends up with an increased breathing rate when running is started. During long distances, the individual has taken so many breaths that it causes irritation of the airways and an episode of asthma is triggered. Angina is a condition characterized by chest pain due to inadequate oxygen being supplied to the heart. This form of asthma is prevalent in cold areas and those that have dry climates. The dry air irritates the bronchioles which causes constriction. This can lead to chest tightness along with difficulty breathing. The ideal way to prevent the condition is to run in warm and humid climates. It is also important to note to take sips of water while running to keep the airway moist. If possible, breathe via the nose which forces air into the sinuses where it collects moisture before moving into the lungs. Angina is a condition characterized by chest pain due to inadequate oxygen being supplied to the heart. When it comes to stable angina, there is chest tightness and pressure during exercise or stressful scenarios but does not last long. The chest pain from angina can be felt behind the breastbone and must only last between 1-15 minutes. The discomfort should settle after stopping activity and the body starts to relax. If an individual engages in running, it can worsen coronary artery disease since the heart must beat faster and requires more oxygen. If the organ does not receive enough oxygen, chest pain from angina is triggered. Remember that this is serious than the stable angina and might be even a precursor to a heart attack. A doctor must be seen if chest pain occurs while running. Chest tightness can be triggered by acid reflux. There are instances where the stomach has a hard time keeping the acid down and can leak back into the esophagus. Pain is triggered since stomach acid is powerful. When working out especially when using weights, the individual might work hard and strain a chest muscle. If a muscle is strained, it becomes swollen and painful while running. The muscle becomes tighter since it is in the process of healing and starts to scar. The individual can still run with a strained chest muscle, but it is vital to avoid any pressing movements such as push-ups until it has fully healed. ← Nutmeg allergy: What are the signs?